A huge thanks to everybody who entered. Our two randomly chosen winners are Nathan B and Thomas G.
Be sure to check your email, gentlemen, and I'll get your details over to Tor right away. 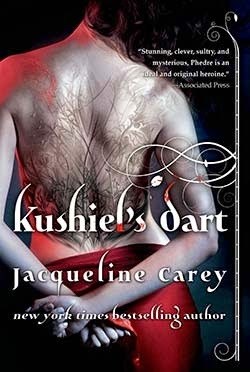 It's hard to believe it's been 14 years since Kushiel's Dart first hit the shelves, but Jacqueline Carey's mark on the genre remains as original and distinct as the marque tattooed upon Phèdre's back. This is a book that attempted to infuse some very dark, very explicit scenes of sexuality and spiritual sadomasochism with the political machinations and mythological constructs of epic fantasy - and which did so quite successfully. Tor Books is in the process of re-releasing the original Kushiel's Legacy trilogy in trade paperback, complete with some exquisite new covers. It's being marketed as 'Fifty Shades of Grey meets A Game of Thrones' for the re-release, which is a bit unfair since it came long before Fifty Shades and just before A Song of Ice and Fire really exploded, but hopefully it will serve to draw new readers into what is an exquisite and original world. To help celebrate the re-release, Tor Books has kindly offered up a pair of copies of Kushiel's Dart to some lucky readers here in the Ruins (Canada & USA only). To enter, just pop me at email at bob[dot]beautyinruins[at]gmail[dot]com and let me know how you follow the Ruins - whether it be here on the Blog, Facebook, Twitter, Goodreads, or Booklikes. Giveaway ends Sunday at midnight, and I'll draw the lucky winners Monday morning. I'm so glad these books are coming out again with a new edition, new covers. Hope more people will be picking them up. This series remains one of my favorites of all time. the cover is so very intricate! I love the new cover (including the new marque, although I don't think it quite captures Phedre's orginial one...). Totally agree with Mogsy though, I hope more people end up reading them. I really want to make the time to read these!